Who knew there was such a thing as Single’s Day? (Props to you if you did know that!) Apparently it’s celebrated dreaded in China on November 11th. Unfortunately, one Chinese man is going to be remembering this Single’s Day for the rest of his life. Deciding he didn’t want to be single anymore, he decided to propose to his girlfriend before the unfortunate “holiday” could visit him again. And this particular man spent a ton of money just to pop the question – and I’m not even talking about an engagement ring. 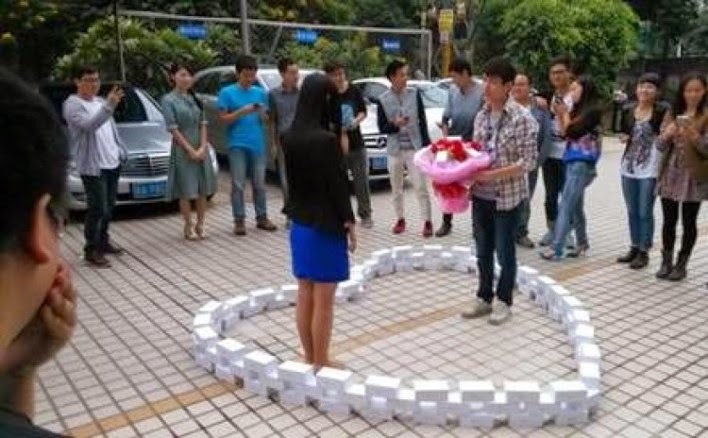 He went out and bought 99 iPhone 6’s, set them up like a gigantic heart, and proposed to his girlfriend inside of the iPhone heart. Unfortunately, love was not in the air, and she said no. I hope all those iPhone 6’s were still within the return period, because the heartbroken guy spent somewhere in the ballpark of $82,000. And no, I have no idea what he planned on doing with the iPhones if she’d said yes. So if you think you’re having a bad day, just look at the photo below.